Decumanus Green | Discretion is the better part of valor! 09 Jan Discretion is the better part of valor! Slipping then digging, digging then slipping, my valiant little Prius struggled up the steep drive. I reached the top and climbed out on to foreboding, icy ground. I felt like Armstrong stepping on the moon. Cummington is a mere forty minutes from my home and shop in Lenox, but climatically it is a world away. While I had left sun and mud behind in Lenox, what I found in Cummington was thickly frozen ground dusted with fine, dry snow that clearly had not seen temperatures out of the teens. 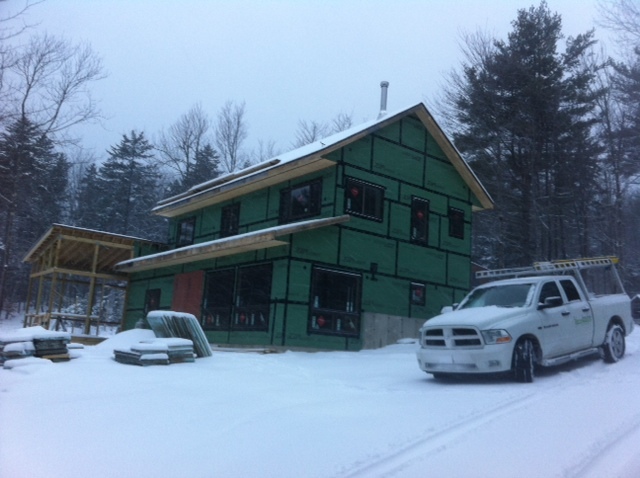 I began to face the elements and set about my task of prepping the job site for a pouring of the slab on the first floor. 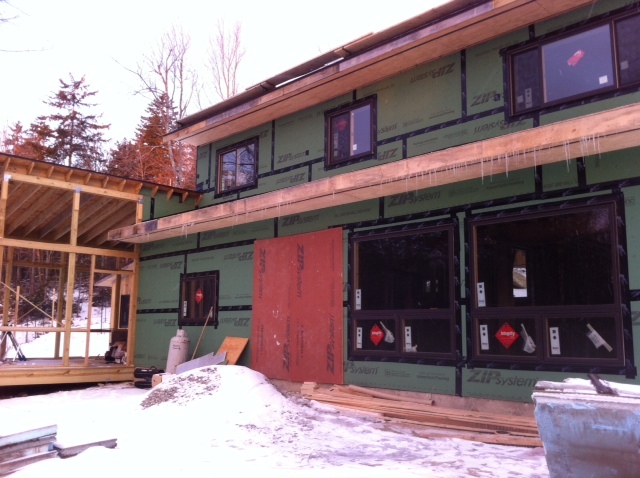 We had prepped weeks ago, placing down two and half inch rigid insulation covered by a thick vapor barrier that had been meticulously sealed at the seams and plumbing penetrations. I began to clear out some tools and move building materials that were ice-welded to the ground. As I carried on, a deep sense of discouragement and futility began to overtake me. “This is going to be an absolute grind out here,” was a phrase that kept rattling in my head. After many discussions and much back and forth with Tom, the concrete sub, and Laurel, the owner, we decided to shut our Cummington project down for the winter. The work was going to be too difficult and too expensive. My reluctance to break stride was overwhelmed by my understanding that it would be just plain stupid to proceed. And as my favorite building scientist Joe Lstiburek tirelessly preaches: Builders, particularly green builders, have got to stop doing stupid things. And so we have. Come April, we will be back at it.